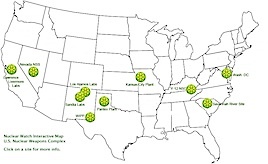 The Kansas City Plant (KCP) has most of its operations in Missouri, with satellite facilities in Arkansas and New Mexico. The main facility is located on 122 acres of the 300-acre Bannister Federal Complex (BFC), 12 miles south of downtown Kansas City, Missouri. The BFC is owned by the U.S. General Services Administration (GSA), which leases the KCP portion to NNSA. The facility is operated by Honeywell Federal Manufacturing & Technologies and employs approximately 2,400 people in support of NNSA activities. The Kansas City Plant was built during World War II to assemble engines for Navy fighter planes. After the war, the Atomic Energy Commission contracted the Bendix Corporation to manage production of nonnuclear components for nuclear weapons at the Plant. The KCP has been the primary site for conducting that mission ever since. In addition to making nuclear weapons parts for NNSA, the KCP makes parts for other DOE offices, DoD, other government agencies, and the United Kingdom. The Plant produces or procures 85 percent of all components that make up a nuclear warhead, including firing and arming systems, radars, guidance systems, reservoirs for tritium, foams, and adhesives. KCP states that it now has its busiest workload in 20 years. Much of this work is for 'Life Extension Programs' for existing nuclear weapons. 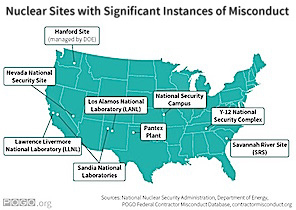 NNSA has about 2 million sq. ft. of space dedicated to nuclear weapons components production at KCP and employs about 3,000 people in those activities. According to the 2009 Budget, NNSA planned to spend $478 million for nuclear weapons activities at the KCP in 2009. "Kansas City, Mo. A sprawling new plant here in a former soybean field makes the mechanical guts of America's atomic warheads. Bigger than the Pentagon, full of futuristic gear and thousands of workers, the plant, dedicated last month, modernizes the aging weapons that the United States can fire from missiles, bombers and submarines. "It is part of a nationwide wave of atomic revitalization that includes plans for a new generation of weapon carriers. A recent federal study put the collective price tag, over the next three decades, at up to a trillion dollars." According to its FY09 Ten Year Site Plan, the Bannister Federal Complex contains facilities for printed wiring assembly, fabrication, final assembly, plastics machining, mechanical welding, and electromechanical assembly. Additional facilities that are managed by Honeywell in New Mexico under the contract for KCP include: the NC-135 Compound, which supports engineering research and development and the assembly or repair of communications equipment; the Air Park Facility, which develops and supports training programs for NNSA's Office of Secure Transportation; and the Craddock Modification Center which builds and equips Safe Secure Trailers and Safeguards Transporters. Along with Sandia-NM, these three facilities are all located on Kirtland AFB, which has been recently designated by the DoD Secretary as the Air Force Nuclear Weapons Center of Excellence for all nuclear weapons systems activities. In addition, Honeywell/KCP also runs a 'Los Alamos Office' that manufactures detonator assemblies for nuclear weapons and fiber-optic sensors for hydrodynamic testing. Under Complex Transformation, NNSA plans to move the main site of the KCP from the Bannister Federal Complex to a new 1.5 million sq-ft facility, construction of which is expected to cost about half a billion dollars. The proposed plant is sited within Kansas City limits and developed by private sector financing. It would be leased to GSA, which in turn would sublease it to NNSA at a cost of roughly $1.2 billion over twenty years. Kirtland Operations would also relocate to a new 306,949 sq-ft facility to be constructed by a private developer in Albuquerque and leased by the GSA to the NNSA. During the proposed transition period, the old KCP facility at the Bannister Federal Complex would remain in operation as activities are moved to the newly leased space in 2012. According to the FY09 Ten Year Site Plan, "Capabilities that are commercially available will be outsourced where possible and remaining in-house capabilities will be properly sized for the anticipated production rates of future weapon programs." 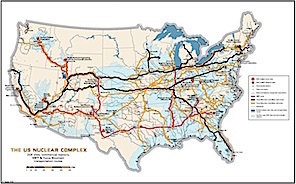 Of the eight active NNSA nuclear weapons sites, KCP was the only site to be excluded from consideration in the Complex Transformation Supplemental Environmental Impact Statement. NNSA argued that decisions made elsewhere in the nuclear weapons complex would not affect KCP, and vice versa. However, NNSA's own language in successive KCP Ten-Year Site Plans strongly rebuts that argument. Moreover, the 1996 Stockpile Stewardship and Management PEIS, to which the present Complex Transformation study is technically a supplement, actively considered consolidating KCP missions to SNL-NM. The 1996 decision not to consolidate was made because of the claimed expense and environmental liabilities of building new facilities at Sandia. That argument is mooted by the fact that NNSA now plans to move to a new facility, albeit one only eight miles away from the old plant. Further, NNSA apparently plans to make that move without comprehensive cleanup of the old Plant, which is heavily contaminated with PCBs and industrial solvents. *The members of the Nuclear Weapons Complex Consolidation Policy Network include Nuclear Watch New Mexico along with national organizations: the Natural Resources Defense Council and the Project On Government Oversight; Tri-Valley CAREs, near the Lawrence Livermore National Lab; the Greater Kansas City Chapter of Physicians for Social Responsibility, near the Kansas City Plant; and JustPeace of Texas, near the Pantex Plant. Follow @NuclearWatchNM Our Mission: Through comprehensive research, public education and effective citizen action, Nuclear Watch New Mexico seeks to promote safety and environmental protection at regional nuclear facilities, mission diversification away from nuclear weapons programs, greater accountability and cleanup in the nation-wide nuclear weapons complex, and consistent U.S. leadership toward a world free of nuclear weapons. Nuclear Watch New Mexico is supported by the Ploughshares Fund: Investing in Peace and Security Worldwide, the Windfall Foundation, the Just Woke Up Fund of the Santa Fe Community Foundation, the New Mexico Community Foundation, and by generous donors like you. Thank You!